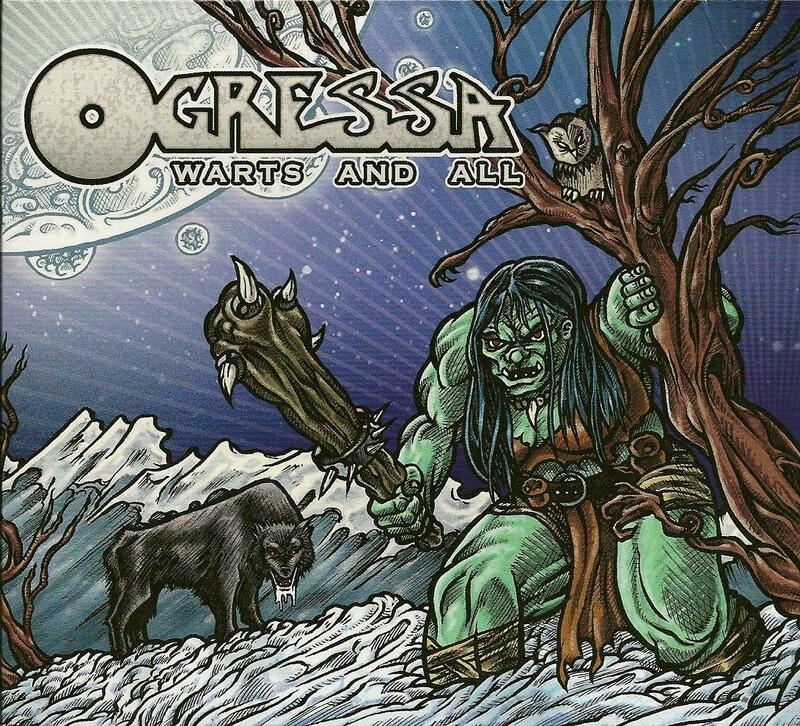 If there was ever a CD cover that gave a perfect image of the music found on the disc inside, Ogressa’s Warts and All is surely it. The band name and album title only enhance the expectation of sludgy, grimy stoner rock, a promise that is absolutely delivered on throughout the album. The cover of Warts and All features the titular Ogressa advancing menacingly, brandishing a wooden club with iron spikes like she is getting set to bash your brains out, and with a suitably disgruntled look on her face. The mean dude in the shadows of the Ogressa monster is Zach Huskey, long surviving member of California stoner rock band The Dali’s Llama. While that band remains very much a going concern, Huskey is presumably suffering from creative overload, hence this new side project, where he is joined by Whores of Tijuana drummer Trent Ramseyer, who switches to lead vocals for Warts and All. While not likely to challenge Pavarotti or Bono, Ramseyer’s gravelly Ozzy-meets-Lemmy-in-a-dark-alley voice is well suited to the dirty, heavy guitar sounds of Ogressa. The first three tracks on Warts And All set forth the recipe for the entire album, that being big fat grinding guitars and stomping rhythms, a-la mid-’70’s Black Sabbath. Indeed, Give Me Some Space practically screams Hole in the Sky at you, but if it is indeed a steal, it is a damn good one. Mange features some far out Huskey guitar soloing, which contains a bluesy element found in all the best ’70’s hard rock bands, while Rational Man opens with a few sustained power chords before moving into a gutsy driving mid-paced rocker, making it one of the albums highlights. Sound effects oddity She Awakens features Ogressa waking up, stomping around her cave, and presumably looking for a few humans whose bones she intends to grind to bake her bread. Lady Ogress is a slow doomy sludgefest that calls to mind the heavy nuggets of Leaf Hound, Warhorse, Uriah Heep and – inevitably – early Black Sabbath. The Boss is quite different, perhaps because it is the only non-original track on the album. First recorded by UK 1977 punk band The Mutants (who were dismissed by punks at the time for being too rocky), The Boss is a guitar instrumental that sounds a bit like The Ventures playing in a damp and dilapidated garage, nicely breaking up the overpowering distorted guitars found on much of the remaining album. Sonaran Debris, a world-weary sonic dirge featuring Huskey on vocals, is followed by the amazing and unstoppable Cuts on My Scars, a real standout track that ratchets up the tempo several notches, fast, funky and ploughing all before it. Album closers Snakehead and Animal Mask return to the sounds of the opening cuts, the former consisting of slow grinding menace, the latter swinging a lead-heavy groove. Ogressa is a celebration of classic 1970’s heavy guitar rock, with a brief nod to “Nuggets”-era garage psych, and laced with ’90’s grunge and stoner rock. If the sound of Black Sabbath with all the miserable bits taken out sounds appealing, give this warts-and-all recording a spin; you will not be disappointed.